Gutter Helmet’s patented design allows rain water to flow freely while keeping out damaging leaves, twigs, pine needles and other debris to give you peace of mind and clean gutters. With Gutter Helmet®, you get the best gutter guard systems with a guarantee that you won’t be cleaning your gutters after the next storm. Gutter Helmet has been saving homeowners time, work and trouble since 1979, when its unique gutter protection design patent was first made available to homeowners. Many imitators have since come and gone, but none of them can offer you the same proven protection from clogged rain gutters. That’s why Gutter Helmet is recommended by Dean Johnson of Hometime and has also been featured on the PBS series This Old House. With Gutter Helmet installed, you can forget about climbing that ladder and risking serious injury. Also, you won’t have to pay anyone to clean your gutters ever again. Gutter Helmet’s patented design keeps out leaves, twigs, pine needles and other debris to give you piece of mind and clean gutters. Rain water flows freely through your gutters and into the downspouts. With Gutter Helmet, you will Never Clean Your Gutters Again. Engineered to last a lifetime, Gutter Helmet installs over new or existing gutters. Gutter Helmet is made of high quality durable aluminum and it’s reinforced with Horizontal Stiffening Ribs. Only Gutter Helmet has a unique textured surface and a PermaLife™ coating that will not chalk, crack or peel. Additionally, it’s available in a variety of gutter colors to blend with your home’s roof, so it beautifies as it protects! Simply put, Gutter Helmet is made to last a lifetime. Each of our systems is installed by an experienced professional and trained craftsman. When your new Gutter Helmet system is installed, our technicians will clean out your existing gutters. Our installation specialists are mindful of your home and take the utmost care to leave your property better than it was before they came. 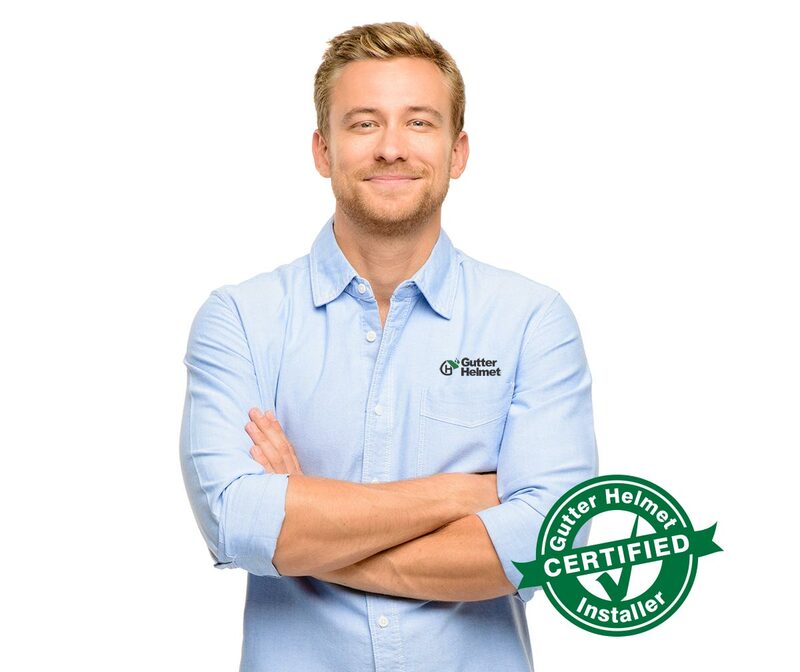 The methods used by Gutter Helmet® installers have been approved by most major roofing manufacturers, ensuring that your roof warranty is intact after our system is installed. For over 30 years, the Gutter Helmet® gutter protection system has been keeping gutters free of clutter and clogs for tens of thousands of home and property owners. The patented nose forward design and rugged construction ensure a lifetime of service. Backed by a Triple Lifetime Warranty, Gutter Helmet gutter covers offer a range of benefits over the years including greatly reduced maintenance, protection against overflowing rainwater, and cost benefits.